Copies of these books were provided by the publisher in exchange for honest reviews. 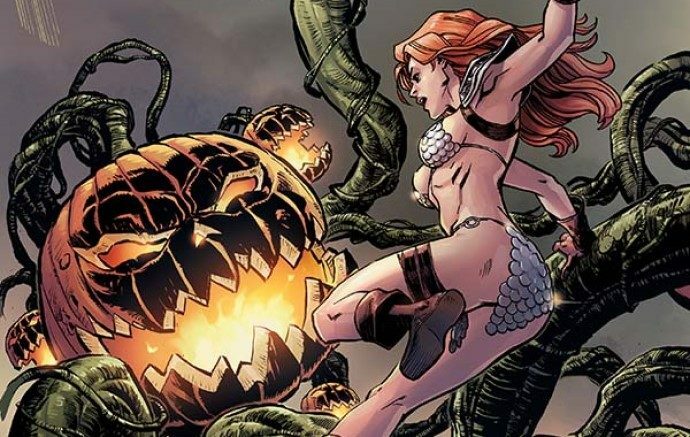 ‘Tis the season for scary things, and two of Dynamite’s leading ladies—Vampirella and Red Sonja—are going to make sure the things that go bump on All Hallows Eve don’t get to have nearly as much fun as they want to. The first thing I need to talk about in this special is the definition Garcia gives to Sonja’s musculature in Burnham’s “Curse of the Wolf” short story. Those are thighs that can crush a monstrous jack o’ lantern without much thought. But that’s not what Sonja is up to during the Festival of the Dead. Her initial plans to drink away the evening while accepting challenges of strength from warriors who think to best her at the arm wrestling table are set aside when an elderly woman begs her aid. True and fearless hero that she is, Sonja ventures off, despite the concerns of Konnar, one of the other warriors who have refused this woman several times already. On the trail of the woman’s missing son, Sonja must face trials both psychological and physical as the veil to the realm of the dead thins, and in the end, shows that her compassion for those in need is not to be trifled with. In “Hail Halcoose,” Sonja is once again denied her plans for festive debauchery when a little girl interrupts her ale-guzzling with a dire warning. Sonja quickly falls into a trap that she must fight her way out of, and then go on to rescue the young girl, who, coincidentally, is also a green-eyed redhead. This is a more lighthearted tale, to which Marques’ art is perfectly suited. Sonja’s broad grin and flowing hair are in colourful contrast to the squelching guts and tentacles that the She-Devil must fight her way through. Both stories are a worthy additions to Sonja’s lore, showing both her serious side and her fun side and offering a taste of why a She-Devil is truly the hero this brutal world needs. Vampirella’s Halloween special is the one-shot of the two that misses the mark. In “Happy Death Day, Vampirella!” Lilith and the Lord of Chaos are up to no good, unleashing all hell on earth for All Hallow’s Eve, and Vampirella must stop it. She happens upon Trina—presumably a shout out to Vampi’s original costume designer, and editor of Wimmin’s Comix, Trina Robbins—who is a young artist and writer who has failed to live up to her dreams. Trina doesn’t have much to celebrate on Halloween, which also happens to be her birthday, but hanging out with Vampirella during a monster apocalypse is enough to spark a friendship between the two. That all seems like a worthwhile plot to work with, but instead, the story is a messy hodgepodge of monsters being thrown at Vampirella for no other reason than to throw monsters at Vampirella. 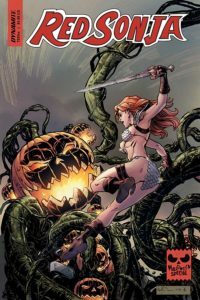 Like the Red Sonja one-shot, “Trick or Treat?” serves as the campy, fun short story to round out the pair. In this one, Vampi gets dolled up to greet trick-or-treaters, but the young boys who show up first are disappointed to find that she’s not the “smokeshow” they expected, because she’s wearing a dress and not her original outfit, and worse, she’s only offering healthy treats. When she gets the trick she rightfully deserves for the latter, Vampirella swears vengeance by bringing back Retro Vampi. She dons her original outfit and gets her blood lust on. This ought to be an amusing and ironic look at the character’s many, many changes over the years. Vampirella even laments that the concept of irony is lost on this generation, but then Northcott and Lobdell’s writing stomps through the story, overindulging in the need to point out what appears to be a personal dislike for the character’s recent costume change, as well as changes to classic characters in general. “No need to retcon the classics,” reads the throwaway last line of the short story, long after I’d hit the, “Okay, I get it,” point. Considering how short the story is, that says a lot about the writers’ need to hammer their point home, when the art was more than enough to make said point the enjoyable affair it should have been. Moreover, the anti-retcon focus seems to miss the fact that Dynamite continues to regularly feature Vampirella in her original outfit—even doing so on the cover of this one-shot—as well as the fact that the character has continually dealt with revisions after her 1969 debut. Despite my disappointment in Vampirella’s Halloween outing, I like the idea of seasonal specials and would love to see more comic book characters get this kind of one-shot treatment, whether it’s taken as an opportunity to dial up the fun or to give the characters a deeper moment of introspection during the holiday seasons.